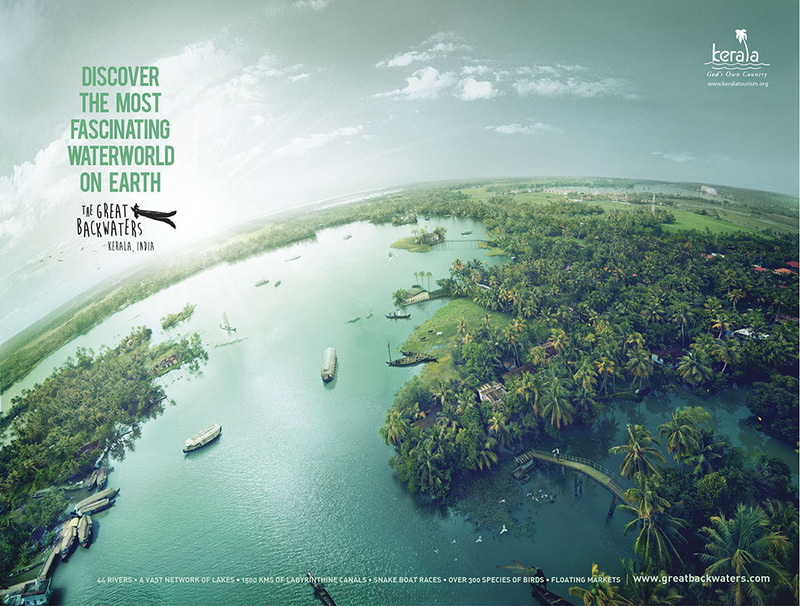 Got picked up from our hotel in Cochin by taxi and made our way to the Kerala backwaters at Kumarakom, near Kottayam. It was Sunday morning and the streets were filled with people walking to church. There is a large Christian population in Kerala and every church was overflowing with people standing outside. We boarded the houseboat at 11:00 A.M. and took off shortly thereafter. 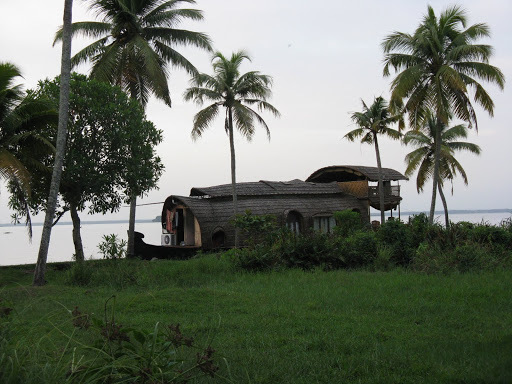 The boat is a traditional Kettuvallam (rice barge) and has two floors. There are two small bedrooms, an eating area and a kitchen on the lower floor. The upper balcony has a seating area, a mattress and pillows to lounge on and watch the scenery go by. 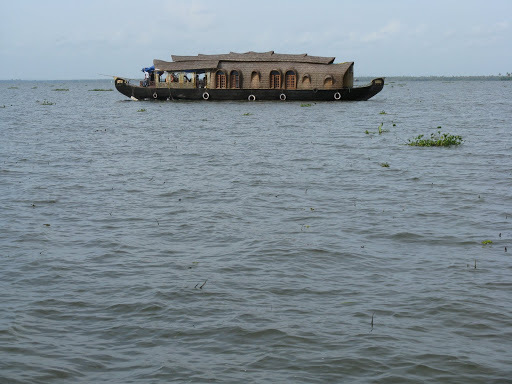 We began on a medium size canal and then made our way onto a huge lake (Vembanad Lake) and cruised along the shoreline. Three guys took care of us – the cook, the captain and the assistant. The cook was especially friendly and spoke pretty good English. He made us an excellent lunch, including some flavorful little fish, served whole of course. We spent most of the afternoon on the lake, which got a little boring because there wasn’t much to see in the way of village life. 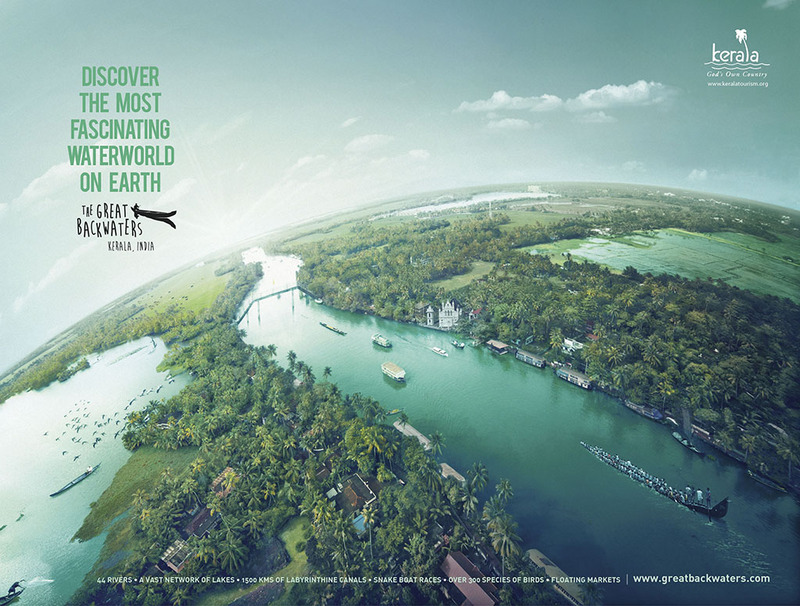 However, late in the afternoon we came to Alleppey and we were able to go on the larger canals. The houseboat is too big to go on the small canals. It was nice to see people and life on the water. Riverboat taxi’s cruise people back and forth, people wash dishes, clothes and themselves in the river. The pace slowed and it sure felt like a different India. People paddled and sang and laughed and waved. 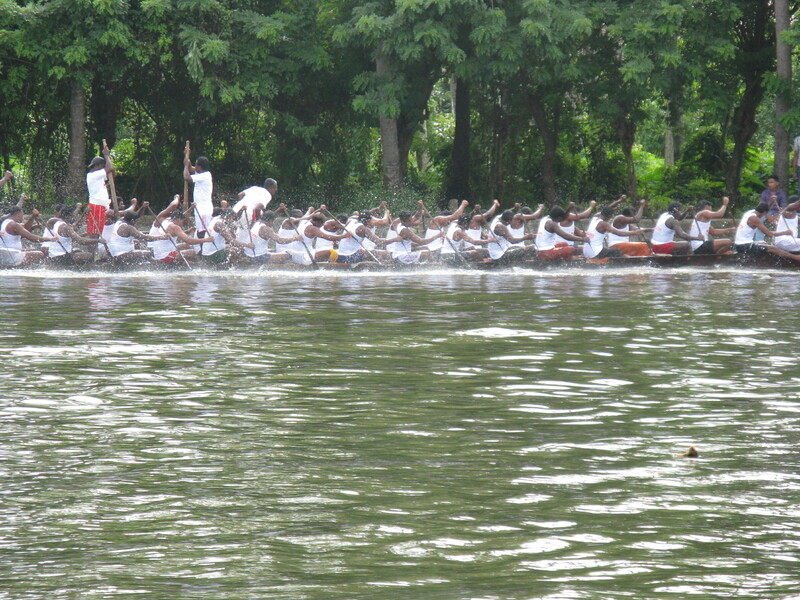 The famous Kerala snake boat race was a week away and we were able to see some of the teams practicing. They are similar to dragon boats, being long and narrow. But the snake boat is even longer and there are a lot more people paddling. There’s a lot of excitement surrounding the big race. They were building the starting gates and the grandstands at the finish line. 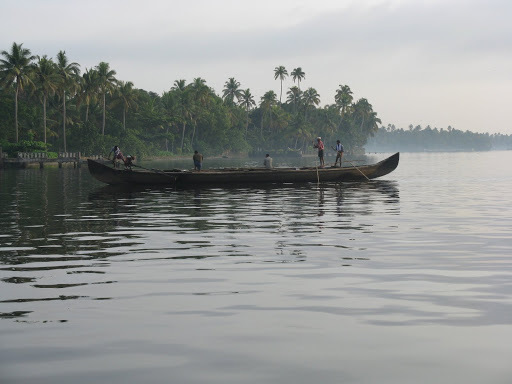 On the backwaters, the snake boats are the only ones who are fast and loud. We stopped along the river to buy beer at one place and at another, the “Ice Cream Corner,” we bought jumbo prawns to have for dinner on the boat. Then we were back on the lake and it was enjoyable and incredibly relaxing. At 5:30 P.M. we docked at a small village. All large boats must be off the lake from 5:30 P.M. – 8:00 A.M. to allow the fishermen to go out and set up their nets for the night.We went for a walk through the village. Kids ran out and waved or asked for pens, which sadly we were not prepared for. Must remember to keep some in the backpack. Back to the boat and the cook set Craig up with a homemade fishing line – he used bamboo for the rod and chapati dough for bait. Craig caught four fish, including two Kerala sharks – he was thrilled. In the end he threw them all back in the water. I think he did it to make his sister happy, considering she ran to her room crying and calling him a murderer. At nightfall, the fishermen set out to lay their nets in the water. We had dinner at 8:00 P.M. and went to bed early at 10:00 P.M. We were in for a long night. The guys had a generator on to keep the A/C running, but it was so loud that we asked them to turn it off. We thought we would just use the fan in our room. Big mistake. It turned out to be even louder and now we felt like we were in a sauna. Then there were the pillows – why would they would give us pillow cases filled with cement? And the sheets – they reeked of that dusky, damp monsoon smell. The sun rose and the fishermen were out to retrieve their nets and their catch. The palm trees made beautiful silhouettes. Even though we were exhausted we appreciated the peacefulness and the beauty. Soon everyone was up and we were on our way, cruising the lake and down another canal for a couple of hours til the end of our journey. Got up at 5:30am and went outside. 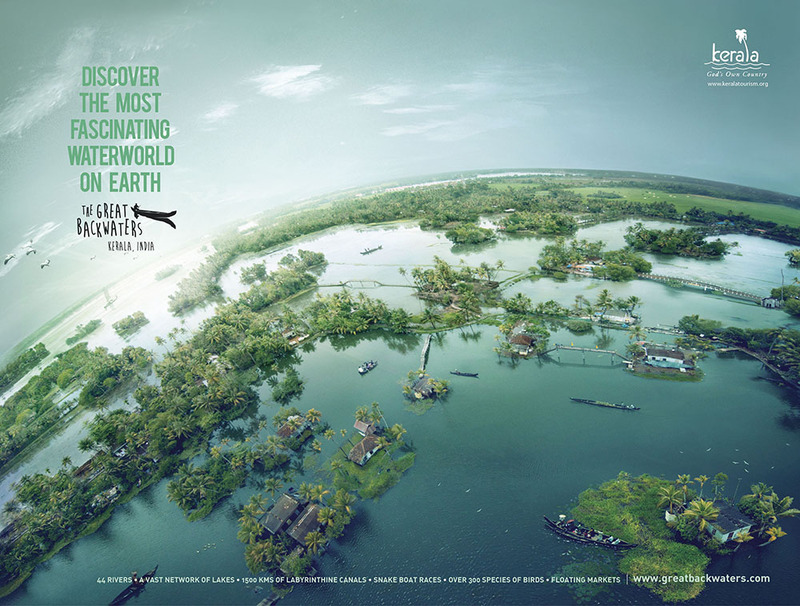 Personally, if I were to do it again, I would go to Alleppey and hire a small boat to tour the backwaters. The best part of the trip was on the canals and I’d rather tour the small ones and see the villages, than spend so much time on the lake. 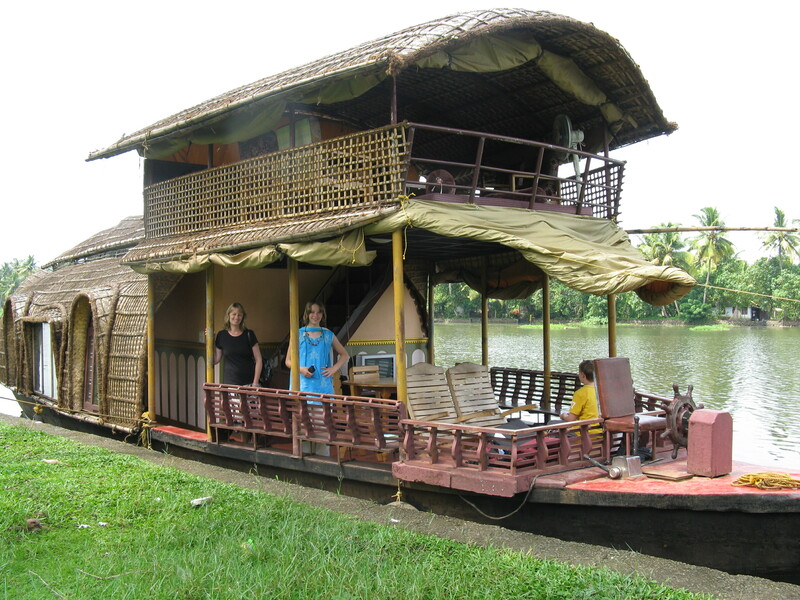 Cost for the entire twenty-four hours for a two bedroom houseboat, including meals for the four of us – 8000INR ($200Can). I’ll post the last part of the trip (Cherai Beach) soon and you can look forward to my guest blogger: Craig!